Well, another season has passed and having finished the Cent’s last game some weeks ago against Hot Wheel Roller Derby, it has given me a chance to reflect on the season. I started the season in my first captaincy role as co-captain of the Cents supporting Captain Hustle. CCR had undergone an off season that involved a complete set of try-outs for the first time, so everybody had been practicing and were ready to take on a new season. We began our first games against Big Bucks and Bristol, a win and a loss made for an interesting day for all involved. 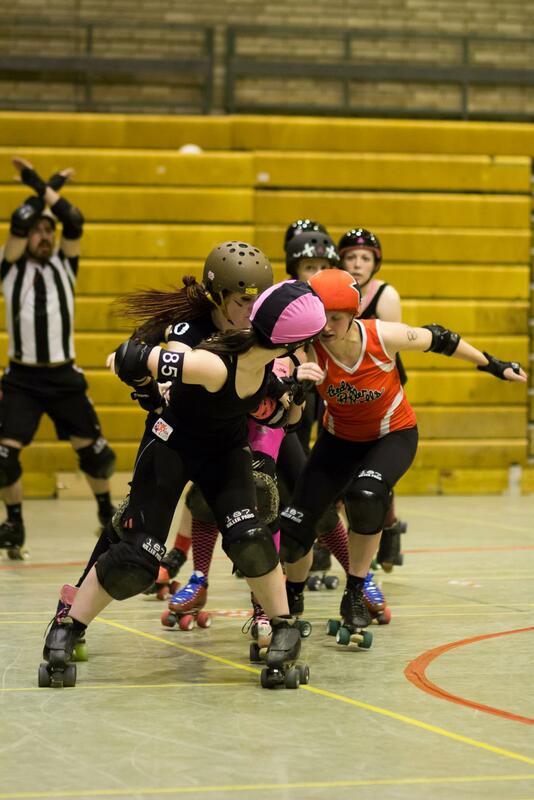 Next up was Leeds Roller Dolls, although we didn’t know it at the time we would meet Leeds again a few weeks later during the Track Queens Tournament in Berlin. 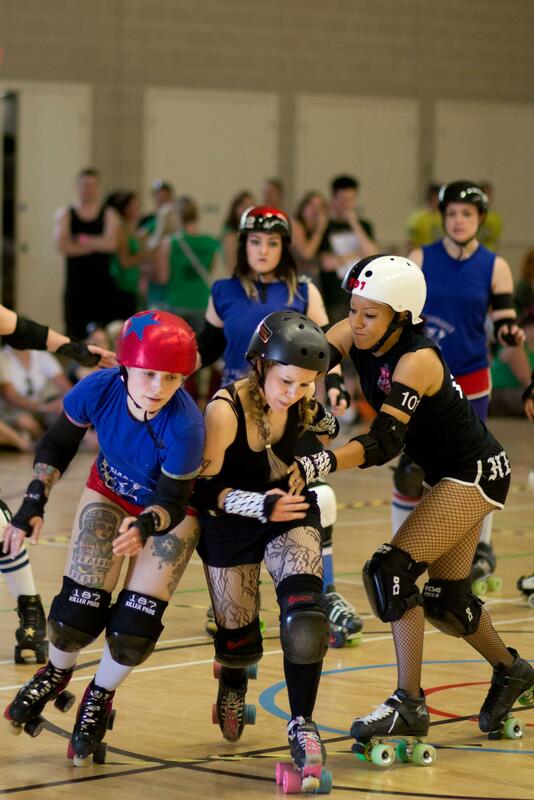 First up was Slays v Whip Its with this being the first time we had played Leeds B Team. They proved themselves to be an excellent opponent with their tactical play giving way to a decent win. What I also didn’t know at the time was this was to be the first game where I had to take the captain mantle (contrary to popular belief, this is not some majestic ceremony where you get handed some form of crown and everyone holds hands and sings hymns, but follows the process of Barry Fight scribbling a ‘C’ on your arm in permanent marker). During the first half, the CCR ‘Curse of the Captains’ struck for the third time and Hustle had to remove herself from the game due to injury. For those of you that don’t know CCR Cent’s Captains have a habit of injuring themselves around Christmas time meaning for the majority of the season the co-captain has had to stand in for them. This co-captain then goes on to win the captain position in the next season, and the cycle continues. Happily for any budding future CCR captains Hustle is the first to return to skating, so we hope the curse is broken, Hurrah! The game itself was possibly one of the most high energy games I have played, but we managed to pull a win out of the bag and went home in high spirits. 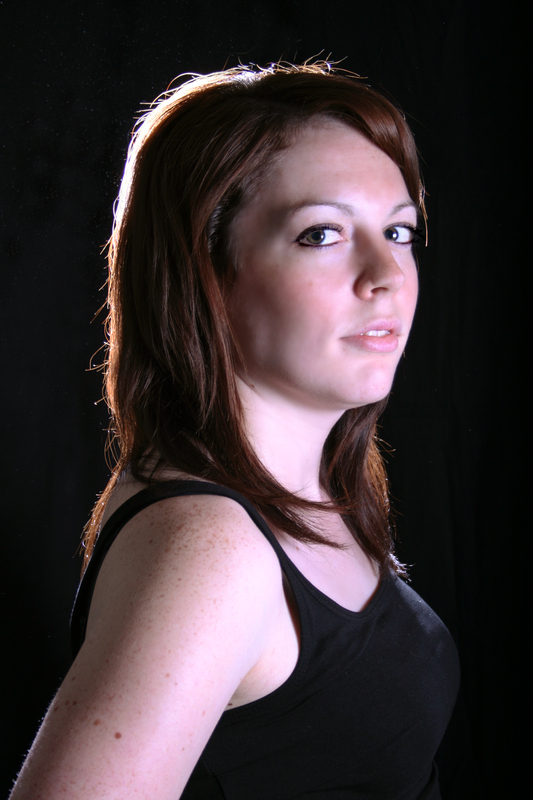 Being a new captain, you can imagine that I wouldn’t envisage my first predicted captaincy slot to involve Europe’s first ranked WFTDA Tournament, but as fate would have it, it did. This weekend would also sadly see the final games (for some time) for several long standing skaters who decided to take time out to focus on their lives outside Derby. The tournament venue was a pretty amazing warehouse filled with busy European worker bees buzzing around who ensured the tournament went ahead with true German efficiency. The atmosphere was amazing and it was great to see so many familiar faces gathered in the same place. One set of very familiar faces were that of Auld Reekie Rollergirls who we would be playing on the first day (all the way to Berlin to meet our most played competitor). It was a close game, but ARRG had the upper hand, which spelled the start their very successful weekend accumulating in one of their newer skaters winning a tournament award! (Can’t really argue with that can you?) For CCR the result meant another meeting with LRD! With CCR girls dropping like flies to injury after our battle with ARRG we had a team shuffle and prepared for our 6am start the next day (ouch!) The hand of fate struck again, with LRD pulling a convincing win out of the bag and leaving us with our final game against Glasgow Roller Derby, our third most played competitor. You might ask yourself at which point I realised that my first captaincy stint had turned into a ‘Baptism in Fire’ scenario? Well, it was about the time I woke up, again at 6am, on Sunday morning and realised I had been hit by a two-tonne ARRG/LRD truck. Both physical and mental preparation are paramount to these highly demanding tournaments, and the thought did cross my mind as to how I was going to face the freezing foggy streets of Berlin to make the trek down to the venue to play another game. Happily for me I proudly play for CCR and had a network of budding supporters both within the team and those who had come along for the ride, which made this but a fleeting thought and suddenly it didn’t seem like quite such a hard task. This led us onto our last game of the weekend, a thoroughly enjoyable match against GRD. December brought an interesting double header when CCR Slays took on Newcastle and the CCR Ragers did battle with Eastern Block, a mixed team who had come together specially in order to give us a good game. Two hard slogs and two losses at home but a great day which saw CCR making new friends with a range of skaters from all the corners of the world (well the North and South East of England). Next up in April was Slays v Croydon, a very challenging game for our B Team (but then they are always up for a good challenge) and Cents v MMR. Slays took on the challenge in true CCR style and played a great game against such a fearsome opponent. 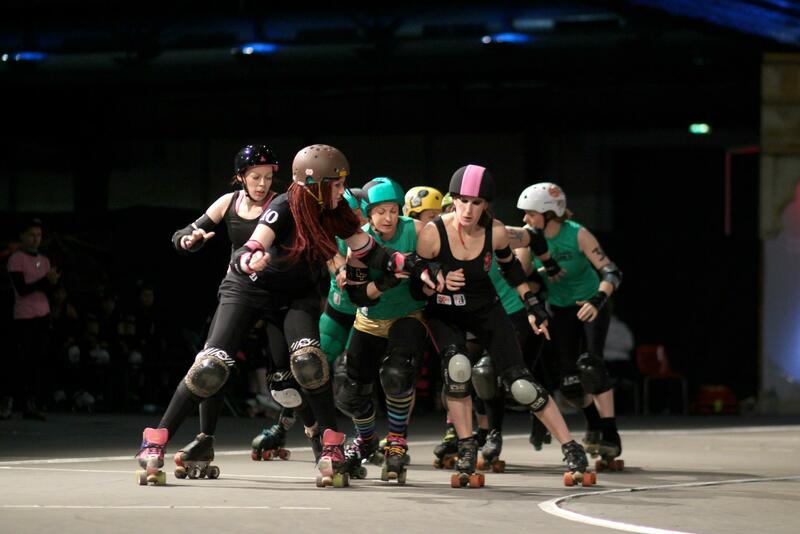 Cents taking on MMR (who have a bit of history of mixed games themselves) was possibly my most harrowing experience of roller derby, as I wasn’t playing! Happily however the team managed to take the win in my absence. Shoetown v Slays saw another closely matched game, with the final score only being decided in the last few jams of the game with a win for Shoetown, but then again they were wearing capes, and you cant really argue with super heroes now can you? (Well you can but you are unlikely to succeed). When an unexpected last minute invite was made to the Great Southern Tournament we were all over getting our tournament hats on again. The best thing about this weekend was how brilliantly everybody on the squad pulled together and shared the load. In total we played four games over two days, three being on Sunday and two being back to back! Everybody played their part and the standard of play from the team really showed off the hard work everyone had been putting in. It was smiling faces all around and the freezing fog of Berlin seemed like another lifetime. As fate would have it, we only played 2 teams Bristol and LRG, twice with similar patterns to both games, but we had the opportunity of playing teams we have never met before. Although we didn’t get to play Brighton Rollergirls, they deserve a BIG shout out for being No.1 on my list of nicest teams I’ve met! 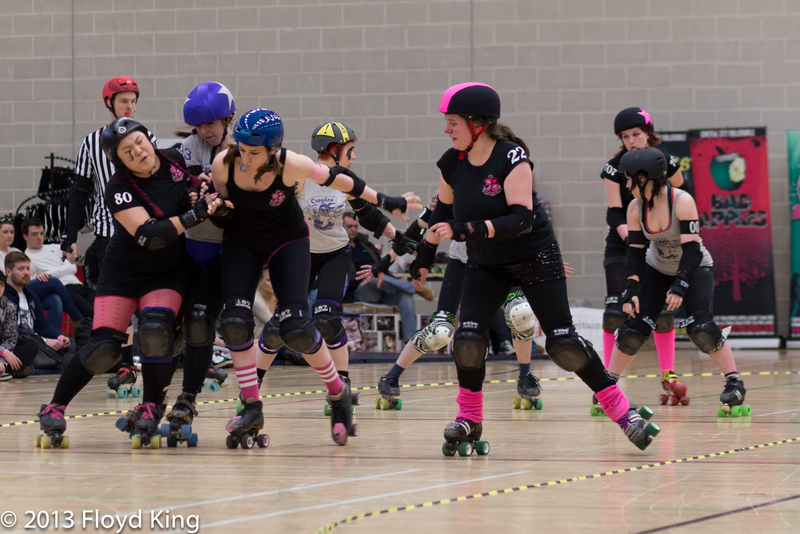 As I am writing this I am eagerly awaiting CCR’s last game of the season against Severn Roller Torrent, and am excited about how Slays are shaping up to take on our last challenge. Whilst this season has been probably one of the most challenging for CCR since her arrival on the Derby scene some six years ago, it has also been full of achievements that have made CCR stronger than she ever has been before. 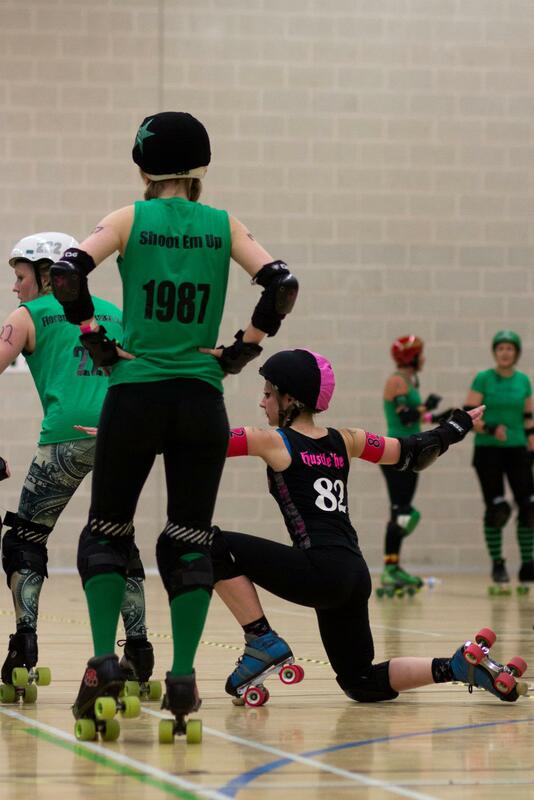 Next weekend see CCR’s Slay Belles travel to Gloucester to meet Severn Roller Torrent, you can find more information on the Facebook event here, or follow us on the day on Twitter @the_CCR.